Here’s the fifth portrait in Streetsblog’s weekly “Why I Ride” series. 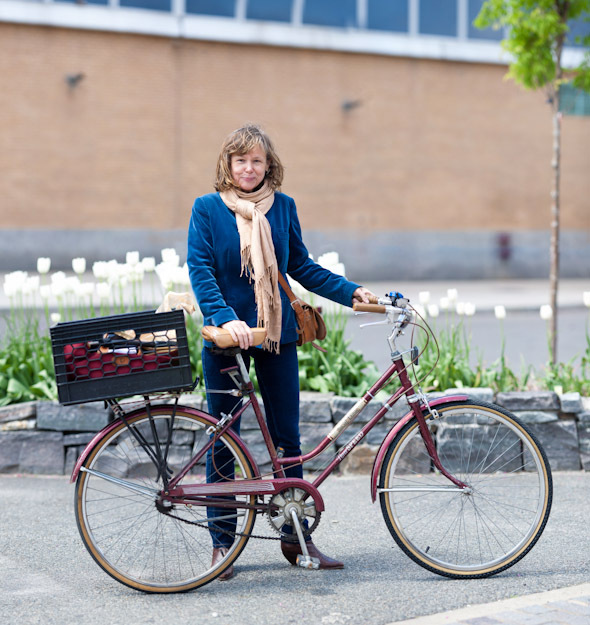 Maureen is a filmmaker who has used a bike to get around New York in all seasons for the last seven years. She rides to commute and run errands and sometimes goes for a long city ride with no destination in mind, just to clear her head. For a long time she rode a nice folding bike, which made it convenient to ride out somewhere and then bring the bike on the subway for the return trip. After that bike was sadly stolen, Maureen replaced it with this cheap used bike, hopefully a less attractive target. So, like many New Yorkers, Maureen now carries a heavy chain lock that costs more than the bike it protects. It’s definitely a much heavier ride than what she’s used to and not nearly as easy to bring onto a train. Still, what she has given up in portability she’s made up in utility, thanks to the ever useful milk crate. That’s the paradox of NYC cycling. A less valuable bike is actually … more valuable. Tighten up your chain Maureen!